Sampinit a red fruit being sold in San Pablo City, Laguna market in March so probably they are available during summer months, the seller said it is called "Raspberries" in English. Sampinit fruit is said to be good source of phythochemicals that helps fight the growth of cancer cells and development of Alzheimer's. This exotic fruit is too rare. I have visited a lot of Wet markets (Palengke) around the Philippines and I only saw them sold in San Pablo City Market in Laguna. Unfortunately, I do not dare to taste fruits which is too foreign to me, especially when the weather is too hot. 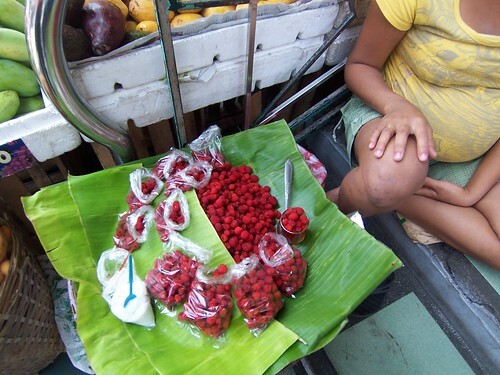 Raspberries is also called in Filipino as Prambuwesas.